After getting his degree in social work, Don Leyrer, 62, spent the first half of his career in the field, including housing abused children, before moving on to law enforcement as a probation officer. The second half of his career was all about business, working as an executive for high-profile Fortune 100 companies. As senior vice president of Comdata Corporation, he helped grow revenues from $25 million to $160 million. When the time came for him to do just what he wanted, Leyrer was searching for an intersection between his business savvy and his drive to help others. But the concept of social enterprise or social entrepreneurism was foreign to him. “I had never even heard the terminology before,” he admits. 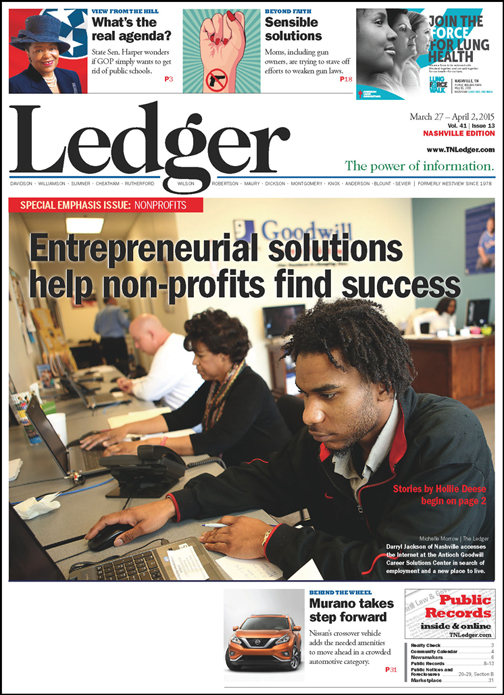 Social entrepreneurs look for business solutions to social problems, and Leyrer embraced the concept with vigor and is now on the board of directors of the Nashville Chapter of the Social Enterprise Alliance, a membership organization for enterprising nonprofits and social purpose businesses. The organization’s goal is to promote financial and sustainable social innovation. Leyrer points out that Nashville is already being recognized as one of the top places in the country for entrepreneurism, and the goal is to also be rated tops in the country for social entrepreneurism, as well. While individuals and small groups are jumping on the bandwagon, there are huge entities that have embraced social enterprise for decades. In fact, it is Goodwill’s whole business model, going back to its inception in 1902 in Boston, repairing donated items to provide jobs for the people who did the repairs. Davidson County Criminal Court Judge Steve Dozier examines a sobriety chip Darnell Whitworth earned from Alcoholics Anonymous. The pair, who had faced off numerous times before in Dozier’s courtroom, met recently at the Gallatin Goodwill store where Whitworth just landed his first job in a decade. One of 165 independent, community-based Goodwill agencies across the United States and Canada, Goodwill Industries of Middle Tennessee collects donated goods and sells them in its stores, and the revenues go to fund job training and placement programs for people locally through Career Solutions Centers. Fletcher says that in addition to the 2,185 people they provided employment to just last year, 17,101 people participated in training and certification, and of 1,289 job fairs in Middle and West Tennessee, 22,012 people attended. And about 89 percent of the employment they find for people is with local employers other than Goodwill. 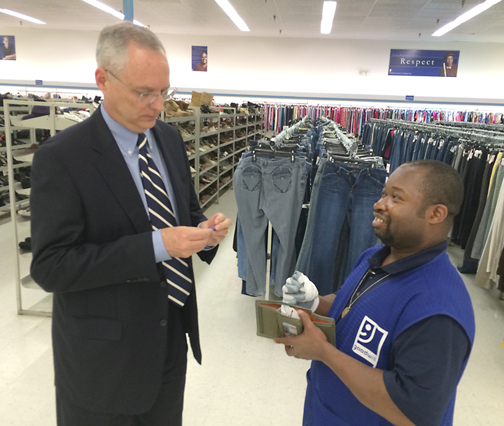 Darnell Whitworth, 40, was one of those who found work through Goodwill. For two decades, Whitworth struggled with alcohol addiction and was in and out of court and jail for a variety of minor offenses. But when his daughter was born with Down Syndrome seven years ago, he began drinking heavily. He got into more and more legal trouble. He ended up going through a 60-day program at Buffalo Valley Inc., addiction treatment center in Castalian Springs, and afterwards the counselors suggested he go through Goodwill’s Career Solutions program to find permanent employment. “My case manager took me to Goodwill and guided me through the computer training, and well, the rest is history,” Whitworth says. He now has a few shifts under his belt as a janitor at the Gallatin store. But he was no stranger to the program. As a special education high school student in Nashville, he went through Goodwill’s training and at the time they found him a job at Opryland. The Nashville native now lives in Buffalo Valley’s transitional housing in Gallatin and attends four Alcoholics Anonymous meetings per week. A few of the T-shirts produced by Project 615, a social enterprise led by Derek Evans and Matt Blinco at began as a fundraising project following the 2010 flood. Fletcher says it is just one success story of many. “Our Goodwill has been here since 1957, so we have a long history, and in many ways, are the classic example of social enterprise,” he says. “A lot of people maybe don’t understand how large our impact is these days on the workforce and the communities we serve. Indiana native Derek Evans, 31, moved to Nashville in 2008 after graduating from college in pursuit of his dream to make T-shirts in the music industry. Along with business partner and college friend, Matt Blinco, they did that. But after a couple of events in 2010, they changed their business model to social enterprise, and Project 615 was formed. First, was the flood in 2010. They created T-shirt designs to benefit Hands On Nashville, raising $5,000. “We thought it was cool we could raise that much,” he recalls. Just a few months later, Evans and Blinco went on a mission trip in July 2010 to work with the large homeless population in downtown Los Angeles. 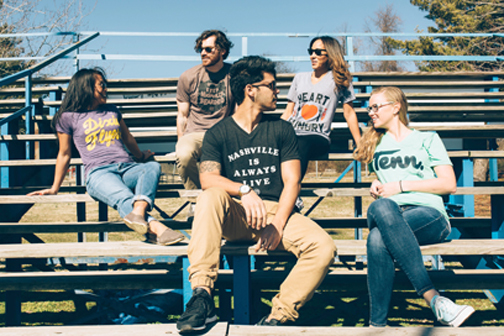 They decided to come up with an online T-shirt and apparel store that raised money for Nashville’s homeless. Initially, their main goal was to raise funds for the homeless. They were introduced in L.A. to Set Free ministries which helps people affected by homelessness, drug addiction or mental illness get back on their feet. Around the same time they were launching a chapter in East Nashville. The main goal was to fundraise, but a couple of years into it Evans and Blinco wanted to do more. “We thought a better way for us to rehabilitate those men and go the extra mile is to actually give them employment, give them a job and a sense of responsibility and dignity,” Evans says. “We implemented employing these men a couple of years into it, and it has really been our main mission ever since to provide rehabilitation thought employment for these men. 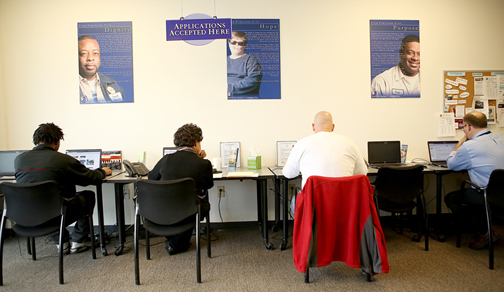 Goodwill Career Centers are set up to help meet the need of those in search of employment. They still fundraise for Set Free. In total they have donated more than $30,000 to the mission, and over the past three years, have employed 25 participants in the program. “We are not a non-profit, but we kind of operate like a non-profit,” Evans says. They lease space inside the church on Sixth Avenue where Set Free is headquartered, and all of the men in the program live next door, making it easy for them to come to work in the print shop. Their goal is to quadruple the employees that they have, which means making a lot more shirts. Evans admits he has been too busy to take advantage of all of the local resources available for social enterprises, but is well aware how much there is. Not only is there the local Social Enterprise Alliance (SEA) that Leyrer is part of, but new CEO and Vanderbilt professor Jim Schorr is moving the national organization of SEA to Nashville too. “We have just a wonderful, supportive ecosystem for it,” Leyrer says. “Whether it is the amazing universities that we have, and so many of them now have such a focus on social justice, social enterprise, social innovation. Leyrer says it is not necessarily a misconception that social enterprises make less money than straight up businesses, but that is in no way detracting people from doing it, especially those with a desire to give back to their communities. Of course, there are some very successful social enterprises with high margins. “It is encouraging to me to see that,” Leyrer says. “An impact investor who invests in social enterprise business in Silicon Valley pointed out to me that this is getting to the tipping point when you see a lot of the ‘A’ players getting involved. Plus it’s a time saver for people who are committed to charity and community involvement. Even long-running non-profits are taking notice of the benefits of social enterprise, and making adjustments accordingly. In the case of Nashville-based Project Return, creating their own temporary employment agency in 2013 was the perfect addition to the employment and training services they were already providing to men and women returning to the community from incarceration. Project Return’s business development director Darrell Hawks is also the PRO Employment initiative’s program director, and he says they launched the social enterprise as an enhancement to the reentry work they have been doing since 1979. Project Return covers all three shifts, seven days a week, for a variety of employers here in town including manufacturers, call centers, customer service, general labor and construction. The enterprise launched in July 2013 with one contract employing a handful of individuals at a call center. Last week they signed their seventh contract and since the start have employed 127 men and women for more than 30,000 labor hours. “That is well over $200,000 in wages paid to those men and women, and that is money in their pockets they can use to help structure their lives after incarceration that they may have not had otherwise, or had legally otherwise,” Hawks says. After they provide the service to the employers, Project Returns invoices them on a monthly basis, a flat per hour rate that covers the cost of wages, plus some operational costs of the program like transportation, fuel, and supplies for the workers. Hawks says the program is not only much needed for the people it employs, but for the entire community. “Nashville alone is a hotbed of incarceration,” Hawks says. “We have four state prisons here in Nashville, a private prison, a federal halfway house, and the detention center for the sheriff’s office. And it isn’t easy. Hawks says as many as 75 percent of men and women who return from prison are unemployed one year after their release. There are certain barriers Project Return helps them with, including social skills – being able to engage with hiring managers, being upfront about their time in prison. Hawks says the social enterprise is working because it takes away the barrier many employers might have of hiring people with criminal backgrounds due to company policy. “Over the past 30 years we have observed our participants’ willingness to do hard work, their interest in finding and keeping a job, so we said we would hire them,” he says.